Although he is only a 15-year-old, Justin Bieber is stealing the hearts of tweens worldwide. The Canadian pop sensation was discovered on YouTube and since his debut CD, "My World," hit stores less than four months ago. He's become a platinum artist, selling over a million records to date. 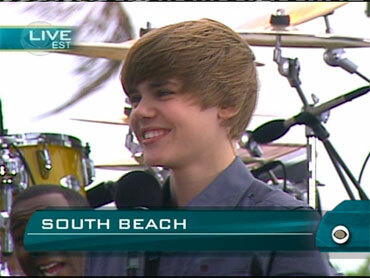 He helped Early Show co-anchors Julie Chen and Maggie Rodriguez kick off Super Bowl weekend in Miami and performed his hit songs, "One Time," "Baby" and "Never Let You Go." Bieber is still getting used to the fame and tween mayhem. "I'm getting more used to it every day," he said. "It's amazing to come up here and have all the fans. It's so fun." On Sunday night at the 52nd Annual Grammys Bieber accidentally said Beyonce's name instead of Bon Jovi. But was it truly an accident or was it deliberate? "Maybe I was trying to get Beyonce's attention," he joked and agreed that indeed it worked. Bieber had the privilege of meeting the Grammy-winning diva backstage. "I got to take a picture with of her and Jay-Z was like 'watch it,'" he joked. Joking aside, Bieber is grateful for his quick rise to superstardom. "It's been such an amazing experience coming from a little town in Canada (Stratford, Ontario) and to have it evolve to what it is today. So I'm very blessed," he said. Well Bieber hasn't just been getting Beyonce's attention -- millions of fans as well as music megastars have taken notice of the young talent. Especailly on YouTube, the Web site that launched his career. Bieber's mother posted home-made videos of him performing cover songs from Usher, Justin Timberlake, and Stevie Wonder on YouTube for friends and family to see. But to their surprise, the amateur YouTube videos ended up generating over ten million hits. Then before he knew it, Bieber's YouTube videos ignited a bidding war between megastars Usher and Justin Timberlake - even more unfathomable for him. Ultimately, Usher won and signed Bieber to RBMG/Island Def Jam. Bieber released part one of his two part debut album, "My World" last fall. "My World Part 1" has not only gone platinum, but has helped Bieber make music history. He became one of the only artists in Billboard history to have four singles from a debut album chart in the top 40 of Billboard's Hot 100 before the album's release. He is also the first artist to have seven songs from a debut CD on Billboard's Hot 100 chart. "My World (Part Two)" is scheduled to be released in March of this year. The first single, "Baby," is already out and features rap star Ludacris.